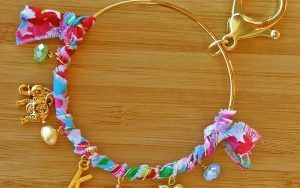 Batik may seem as mysterious as it is beautiful, but don’t let its exotic beauty fool you. 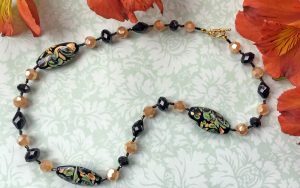 Batiking is simply painting melted wax onto fabric, dying it, and then removing the wax. The areas painted with wax will remain the color of the fabric, and everywhere else will be dyed. 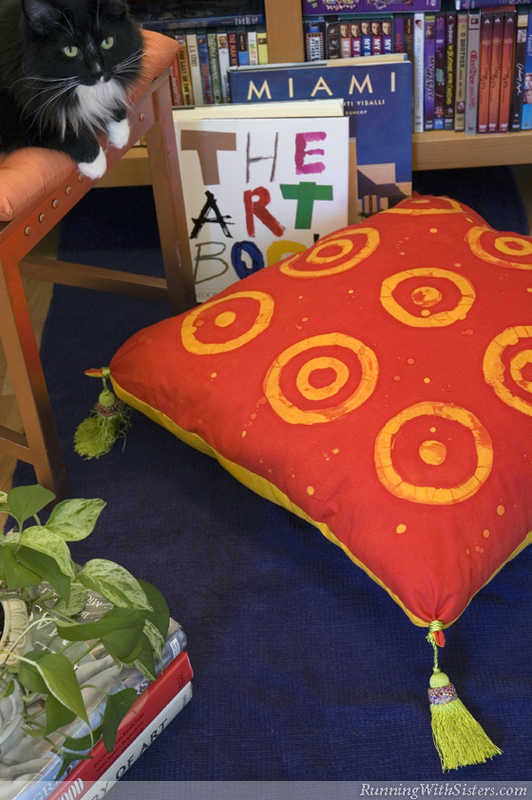 Once you’ve created your own hand-dyed fabric, show it off by crafting a simple but elegant floor pillow––perfect for living room lounging! 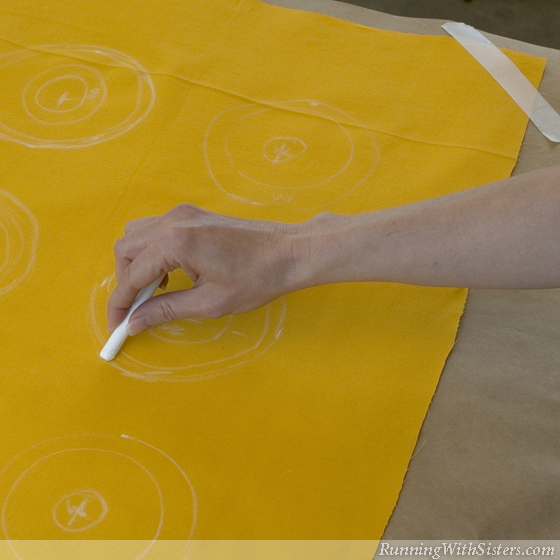 Using chalk, draw nine loose circles in a grid on one of the pieces of yellow fabric. Add accent dots and circles to the center of every other circle following the pattern as shown. Melt the beeswax and paraffin together in the small pan until very runny (but not smoking). 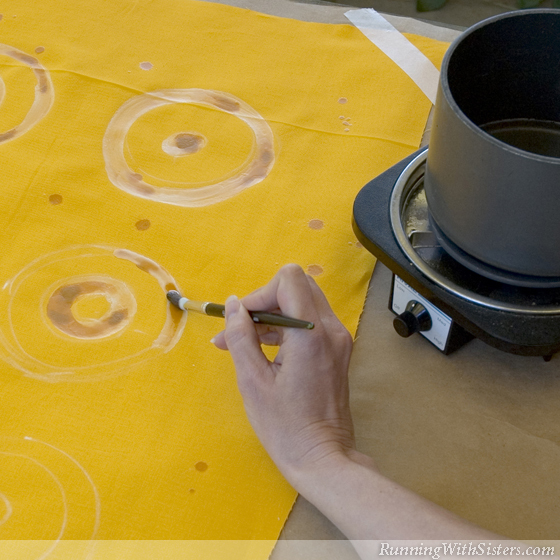 Paint the melted wax onto the fabric following the chalk pattern. 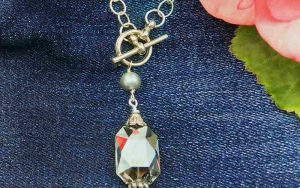 When the wax has hardened on the fabric, turn the fabric over and repeat on the back (you will be able to see the wax pattern from the other side). 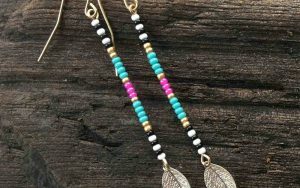 If you drip wax outside of the pattern, don’t fret—release your inner Pollack and add drips all over! To prepare the fabric for dyeing, don your gloves and dissolve one cup of soda ash in a bucket filled with one gallon of cold water. (Soda ash tends to clump, so stir it thoroughly until dissolved.) 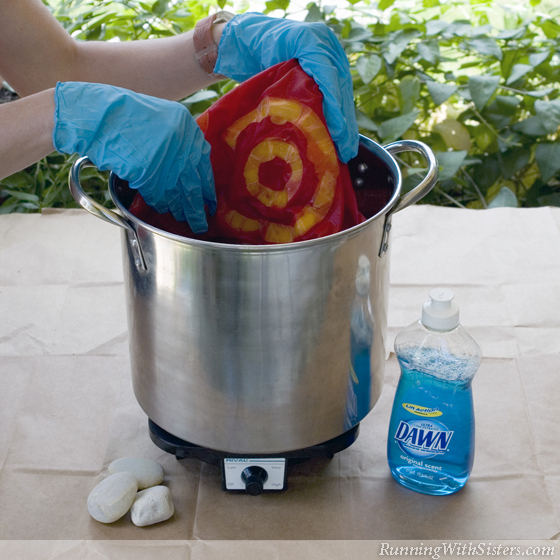 Soak the wax-painted fabric in the soda ash bath for 20 to 30 minutes. Remove the fabric from the bath and let the excess water drip off. 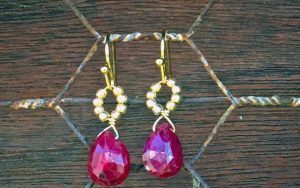 Mix two teaspoons of dye with eight ounces of water in the squeeze bottle and shake to mix. 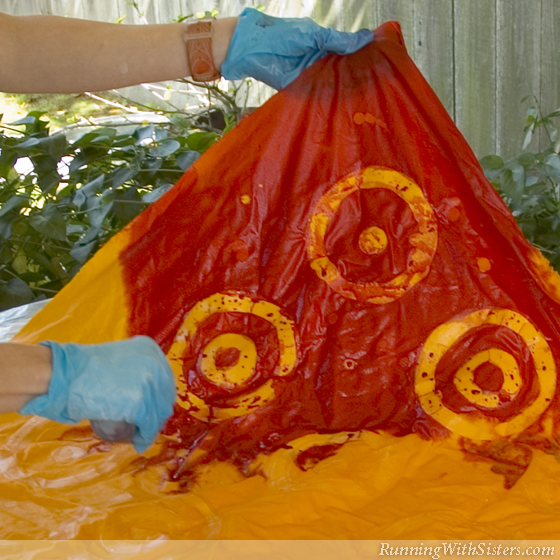 Lay the wax-painted fabric on a plastic-covered surface and squeeze the dye onto the fabric, soaking it evenly. 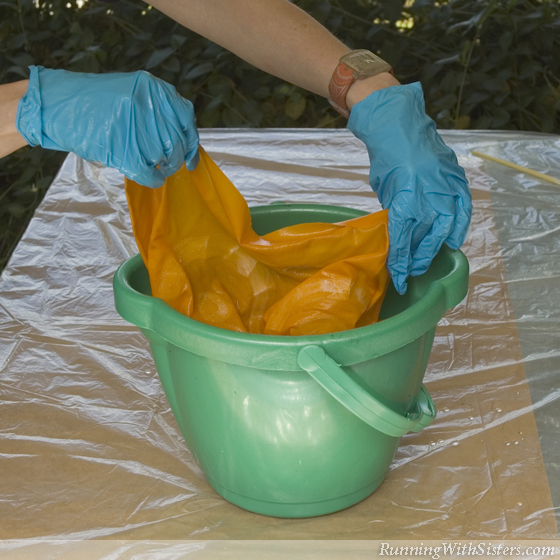 Gently fold the dyed fabric, being careful not to crack the wax, then place inside the Ziploc bag. Let the dye set for 24 hours. 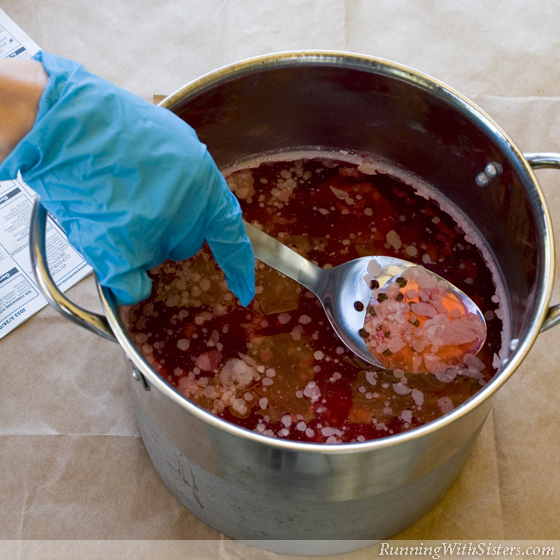 Once the water has completely cooled, skim the wax off the surface with a slotted spoon. Remove the fabric and rinse. Repeat Step 5 if any wax remains. Let the fabric dry. 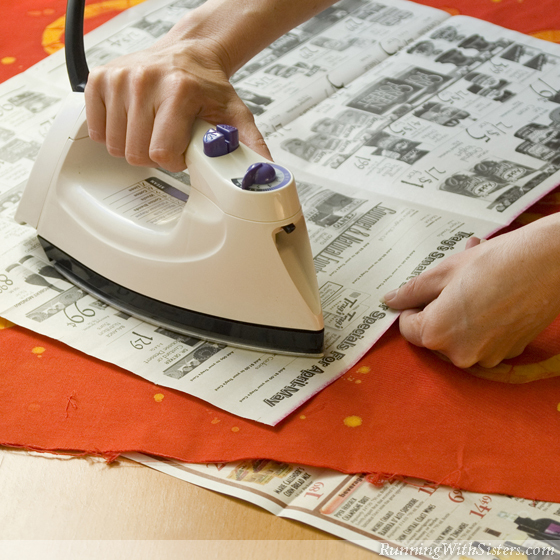 Wax On Wax Off: To remove small amounts of leftover wax, iron the fabric between sheets of newspaper. 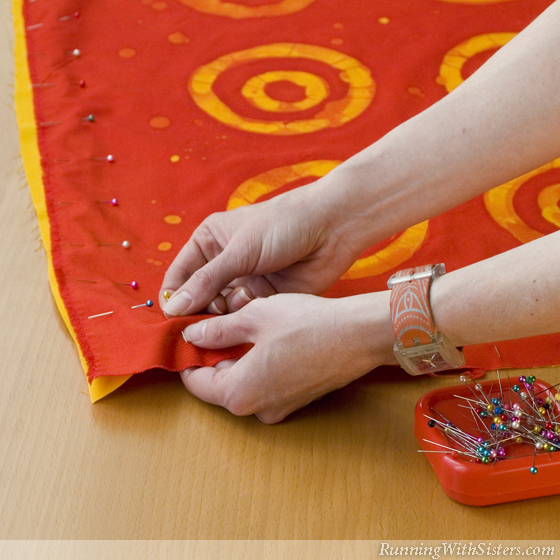 Pin the batiked fabric to the other piece of yellow fabric with the wrong sides facing out. 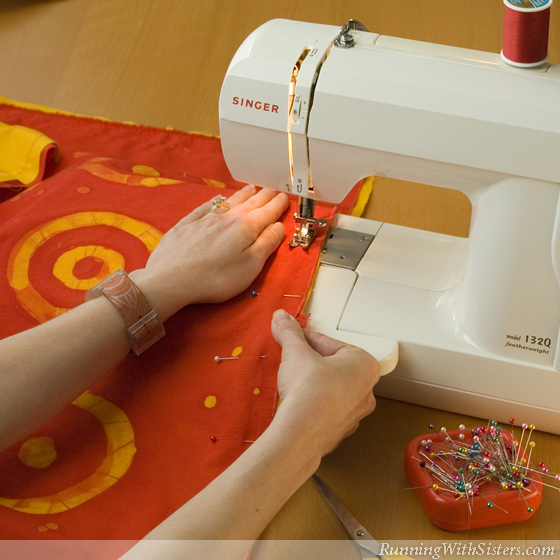 Using a sewing machine and a straight stitch, sew all the way around the pillow cover one-quarter inch from the edge. Leave a four-inch opening on one side to insert the stuffing. Remove the pins. 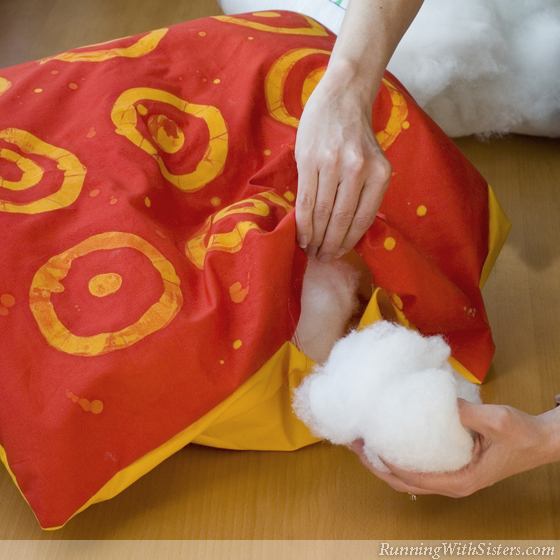 Turn the pillow cover inside out and stuff with the fiberfill. 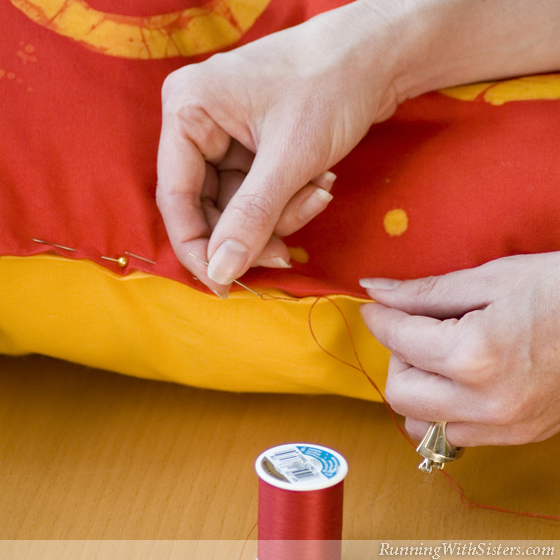 To close the pillow, fold the edges of the opening inside and pin together. 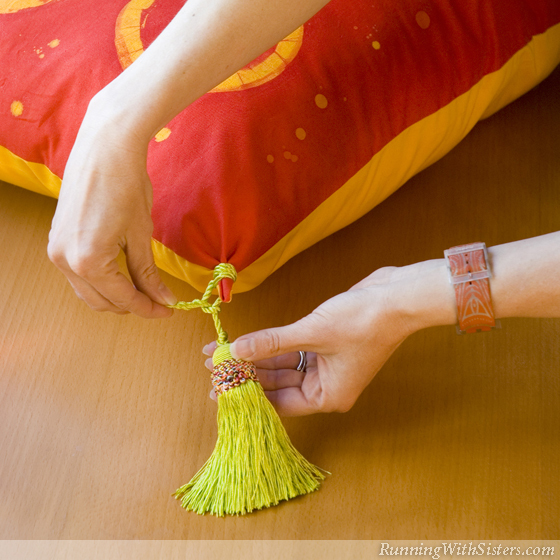 Tie one tassel around each corner of the pillow and secure with a double knot.